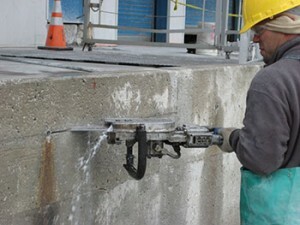 When it comes to concrete cutting, your workers will need the highest-quality equipment possible. Diamonds are usually associated with expensive jewelry. But most people outside of the construction and concrete working industries underestimate just how versatile diamond is. Only a small portion of those gems are used for that purpose. A vast majority of diamonds, both real and synthetic are instead dedicated for cutting concrete. There are few substances on the planet, either natural or synthetic, that are harder than diamond. Because of this quality, they are ideal for slicing through concrete, although you should watch out for anything that might be buried underneath the surface you are sawing. Diamond also excels at transferring heat, meaning the blades are unlikely to melt due to the immense amount of heat generated by all the friction that the cutting process needs. The cores of these diamond saw blades are made from steel. Occasionally, you will find steel hubs instead of cores. The diamonds used for the edges are infused with metallic powder and then heated to form a stronger bond and a sharper blade that won’t dull as easily. Because the edges are larger than the hubs or cores they are attached to, they can slice through the concrete more quickly, even if the concrete has been reinforced somehow to make it more stable, such as with rebar. It’s a common misconception that the diamond saw blades use a cutting motion. They actually grind their way through the concrete. Eventually, this process wears down the diamond edges, but it’ll take awhile. When one layer is gone, there’s another underneath, so the blade doesn’t need to be switched out right away. When choosing the blade, think about the quality of the diamonds you want to use. Then think about how much concrete needs to be cut, both in terms of surface width and overall thickness. A block of concrete is likely to be thicker than a few layers of drywall behind it. You’ll also have to factor in the aggregates used in the concrete – how much gravel, crushed stone, and sand was mixed in with it? These questions will also help you choose the right saw for the job. When it comes to choosing the saw, you will need to answer the questions about the blade as outlined above. However, you will also need to consider how much horsepower the diamond saw blades have. On top of that, you’ll also need to consider how fast the blade spins once it activates, and if it is safe for your workers to operate. This entry was posted on Friday, November 16th, 2018	at 1:49 pm	. Both comments and pings are currently closed.